As far as menswear’s concerned, it’s not easy being short – and I speak from experience. When it comes to off-the-rack tailoring, coats, shirts and trousers, it can be a lottery just trying to find anything that fits. The problem is that the majority of brands utilise the same ‘average’ body type when cutting their garments, which just so happens to be tall, slim and in perfect proportion. A shape that is actually pretty rare in real life. Add to that the current trend for longline tees, cropped trousers and fitted bomber jackets – all items that can look out of proportion on shorter guys – and just pulling together a decent outfit in the morning can be tough. But never fear – we’re here to help. Below you will find who we consider to be the best retailers and brands for shorter gents, to make looking good that little bit easier. As well as offering sizes down to XXXS, ASOS provides shorter length trousers as standard on most of their own-label tailoring, negating the need to get them taken up. Add to that plenty of brands which cater for shorter guys (such as Carhartt and Cheap Monday) and a ‘shop by size’ feature, and this e-tail giant is better stocked than most high street stores for men on the slighter side. This cult Newcastle-based menswear store has a strong focus on streetwear, offering a wealth of labels that are ideal for shorter men. On the tailoring side they stock Thom Browne, whose suits might be a mortgage-level investment but are cut short and in proportion, and who also makes more affordable items like knitwear and shirts. Other brands to look out for include Japanese labels such as Journal Standard, who produce premium basics like bomber jackets, sweats and tees in slightly shorter fits, as well as edgier brands like Sasquatchfabrix and Neighborhood. They also have a strong selection of pieces from A.P.C. and YMC – two labels that we’ve found make good outerwear for smaller guys. While it might not seem like an obvious choice, Sunspel’s T-shirts and sweats are made from high quality cotton that practically shapes to your body – perfect for achieving a more custom fit, no matter what your size. With a little wear, the brand’s tees break in easily and after a couple of washes, look just right on shorter frames. It’s also well worth checking out its selection of shorts and outerwear. Available at sunspel.com and Mr Porter. Vintage shops are a gift to smaller men. Back in the day, garments were often cut a little shorter and boxier, and there was a lot more custom-made clothing around – we’re looking for 1950s-1970s pieces here, especially things like denim shirts, coats and workerwear. Beyond Retro has a particularly impressive online store stocked with hundreds of vintage sweats, flannel shirts and jeans – though prices are around the £30 mark, quality is often much better than you’d find on the high street for the same outlay. There’s something about Oliver Spencer’s outerwear and shirts that fit slighter frames just right. The designer favours shorter, more pulled-together pieces such as chore jackets and bombers with straight hems (rather than ribbed), which look good whether you prefer them fitted or slightly oversized. Available at oliverspencer.co.uk and Mr Porter. The Japanese retailer isn’t ideal for shirts when it comes to shorter gents, but for sweaters and knitwear it scores highly – great, considering you can pick up premium quality cashmere and merino wool pieces at unbelievably low price points. 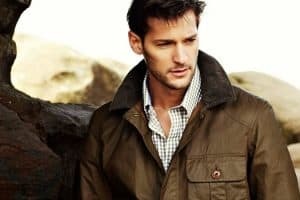 Its range of chinos and jeans is also superb and each UNIQLO store offers free alterations, taking the hassle out of needing to get everything professionally tailored. If you’re not yet familiar with J.Crew’s famous ‘Ludlow’ suit, it might be worth getting acquainted. One of the cornerstones of the US brand’s offering, it comes in a range of colours and materials, from Japanese cotton to Italian linen, as well as short and regular sizes – both of which are widely regarded as an excellent choice for men of below average height.